Because Facebook video ads autoplay without sound until a user clicks on them to hear more, adding subtitles was one way to better capture a scrolling user’s attention. But now that all of them can be captioned using a free tool provided by the platform, you’ll need to do more to ensure yours stand out among the silent masses. Inexperienced marketers may make the mistake of only running a small handful of ads to the same target market. Seasoned marketers know they should be testing all parts of the ad campaign, including the messaging, visuals, audience, and placements. Facebook video ads testing needs to be organized and deliberate, so you can easily compare the number of clicks, views, likes, conversions, and other results. These are the metrics you’ll use to gauge the effectiveness of your ads and optimize each campaign throughout the flight. If you want your video ad to drive traffic to a landing page, it’s important to think about the secondary action as well. To optimize that page for your audience, confirm that it matches the ad and provides a seamless experience for the user. Also, refrain from bombarding your potential customer with too many offers—a landing page with multiple offers generates 266 percent fewer leads than one with a single offer. Facebook’s automatic bid feature is another easy trap to fall into. Using it can be effective, but savvy marketers know you lose the opportunity to prioritize your bids for the best-performing ad sets. If you know your conversion rate and value, you should set a maximum cost per click (CPC) manually to ensure you’re always delivering a positive ROI. If you rely too heavily on auto bid, you can end up going over your budget to pay for clicks that aren’t really worth the additional cost. 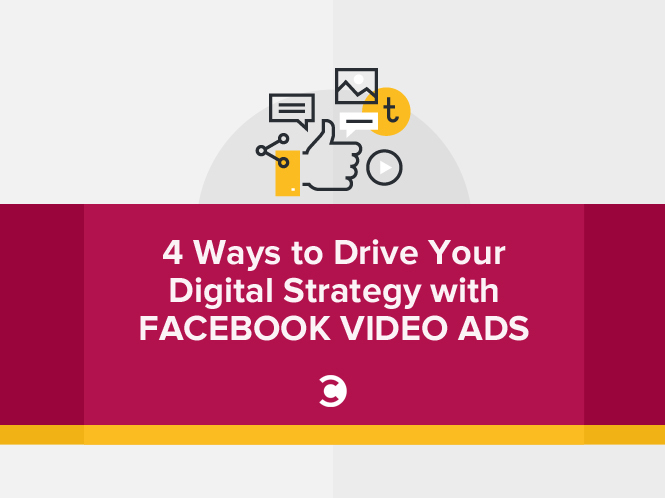 If you’re serious about using Facebook video ads to generate business, here are four keys to maximizing their value as part of an effective digital campaign. First, create a context card that synopsizes who you are, what your offer is about, and why users should give you their contact info. Then, choose the “full name” and “email address” fields in the lead form—if prospects have to fill out more than that, they’ll be less likely to convert. Do you have a list of your customers’ email addresses? With it, you can leverage the amazing amount of data at Facebook’s disposal to find people who will be receptive to your product or service without the trial and error that’s typically involved. Using various algorithms, Facebook can take data points on your existing customers to find and target users with similar qualities, interests, and demographic characteristics. 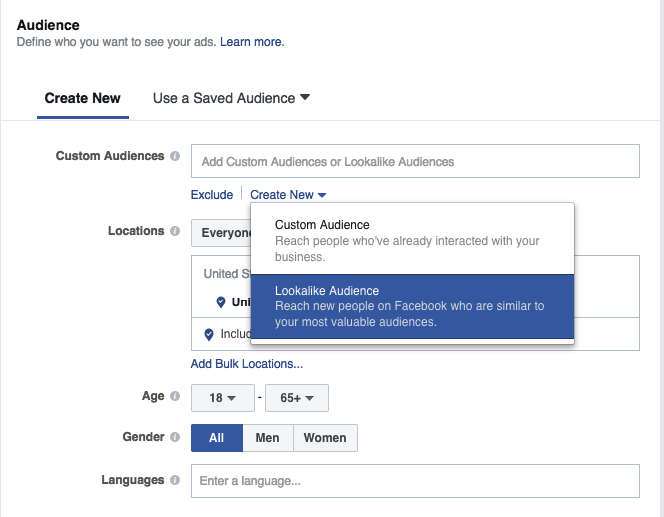 To create a Lookalike Audience in Facebook’s Ads Manager, go to your Audiences. 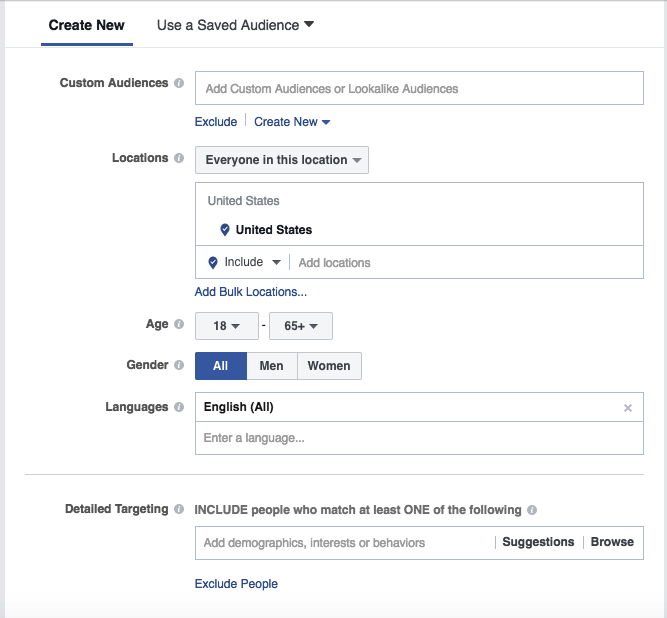 Click on “Create Audiences” in the top left corner and then “Create a Lookalike Audience.” Then, select a source (e.g., a custom audience, page, conversion pixel, or a mobile app), the targeted country, and your desired audience size (e.g., a percentage of country’s total population). It can take up to 24 hours before you see your Lookalike Audience, but as long as you’re targeting ads to that audience, it will be refreshed on at least a weekly basis. If your video does lead viewers to a landing page, make sure you’re tracking the final cost per lead (CPL), not just the CPC. You don’t want to pay for accidental or curious clicks if you’re looking for real leads who match your predefined personas, so focus on optimization. You can run ads and get incredible CPC rates and terrible CPL rates, and this typically means you have created a very catchy ad that hasn’t been optimized for the target audience. CPL models may be pricier, but when they drive actual sales, they provide a greater ROI. Multiplying the number of Facebook visitors you’re seeing by the conversion rate will give you the number of leads. This formula helps you determine which ads are performing best and the cost of each lead, and you can adjust your spend based on this calculation. First, count the number of visitors to your website during a specified time frame—30 days, for example. Then, look at all of your leads in your DMS or CRM, and if possible, filter them by source (i.e., third-party lead generator, online ad, or search). If you don’t know how to do this in your system, you can use Google Analytics. Once you have the number of leads, determine your conversion rate. For example, if 1,000 Facebook visitors resulted in 10 leads, that’s a one percent lead conversion rate. You can calculate the CPL with a simple equation: Overall cost divided by number of leads equals your CPL. 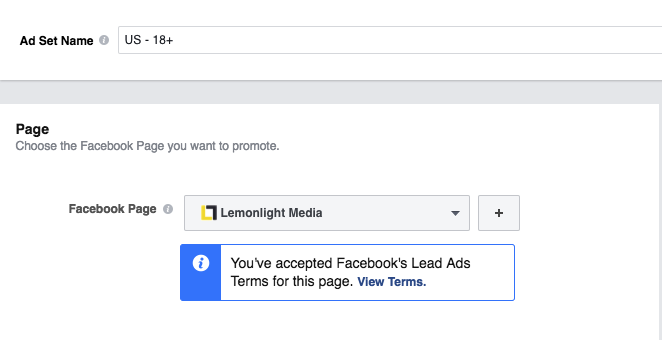 So, if a $400 Facebook ad generates 10 leads, the CPL is $40. 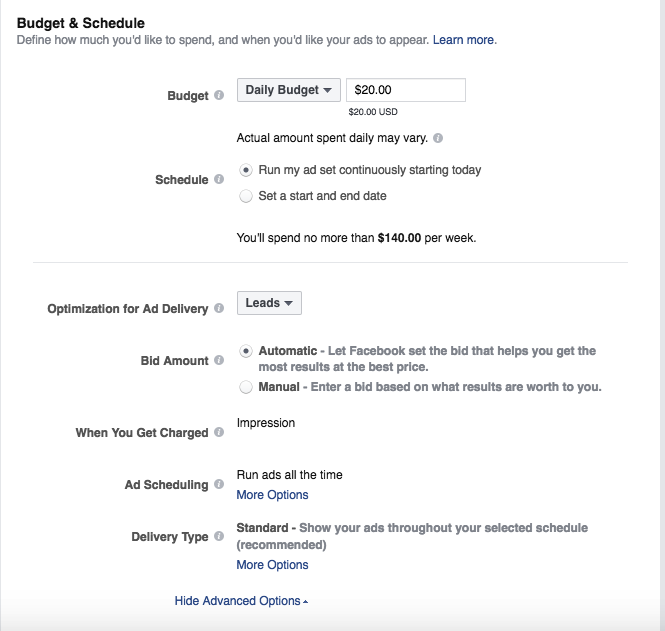 Track your Facebook video ad data so you can recognize trends and use them to your advantage. Testing one variable within each ad set allows you to easily see what’s working and what’s not. Use multiple ad sets to test different variables, and continue to tweak them until you have optimized every ad for its target audience. 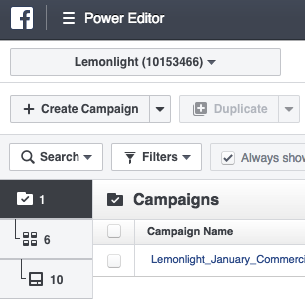 Facebook offers split-testing tools that make it possible to divide your audience randomly so identical ads (aside from the selected variable) can be tested without overlap. Whichever performs better, per your goals, can be tested against other ads and variables, and you can add up to three variations. To optimize campaigns, test multiple target audiences and ads for each. 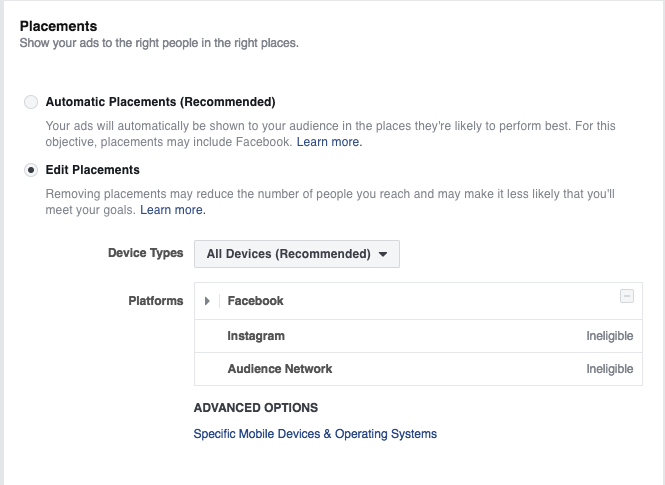 You can split your target audiences up by demographics (e.g., location, age range, and gender), and Facebook will break down your ad’s performance based on those. What’s more, Facebook’s reporting tool lets you know which age bracket and gender made the most conversions. Based on that data, you can leave poorly performing underperforming demographics out of your next test. You can use country, gender, interests, and age to test your targeting. To optimize creative, try testing your image, text, placement, headline, and landing page. Choosing one metric gives you a baseline for your A/B testing, so first test the elements that you think will be most effective. The more you can test, the better your optimization efforts will be. Facebook has an enormous user base, and it’s the nature of the platform to collect a staggering amount of information about each individual. For a business owner or marketing team, this information allows for incredibly targeted marketing opportunities with a high conversion rate. Taking advantage of Facebook’s free tools is a great way to run more effective digital marketing campaigns. If you’re diligent enough to track your data and test, test, test, you can easily optimize your video ads to provide the highest ROI at virtually any budget. Hope Horner is CEO and founder of Lemonlight Video Production, a company that produces and distributes branded video content at scale. Hope is a three-time entrepreneur who has been featured in Inc., KABC, Extra, and other publications highlighting her successes in the Silicon Beach community over the past decade.